We seem today to have so little control over our lives, but Mr. Kilpatrick brings out that our lives are our thoughts objectified. We are what we think. Then he analyzes the source of our thoughts. He writes about the carnal mind, the human mind, and the divine Mind, showing a distinct difference between the three. He explains that there is present an atmosphere of mortal thoughts and emotions outside the individual mind. This mental atmosphere has no power to control or harm us unless we accept it into our own consciousness. We do not originate the illusion of matter and mortality ourselves. Only as we accept certain aspects of it into consciousness do we seem to experience mortal existence. Our entire experience is governed by either the carnal beliefs or divine ideas that occupy our mind. All things are subjective – health, affluence, relationships. Because we are already mesmerized by the belief that matter and evil are real, our prayerful work is to purify consciousness through understanding our oneness with God. Thus we free ourselves of harmful illusions by replacing them with divine ideas. As we replace the carnal mind with the one Mind, we find infinite blessings just at hand. 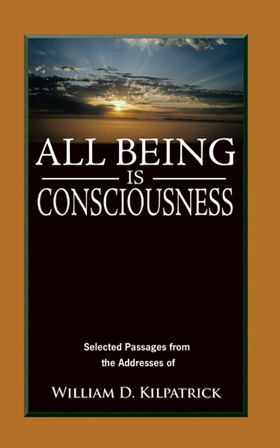 This book is a powerful statement concerning the subjective nature of being – a subject that has never before been explored in such depth. Mr. Kilpatrick writes: “The only reason you and I see another person in need of anything is because of the need in our own consciousness. So human need exists in individual consciousness, and it is the human consciousness that must be healed of the human need and not matter or person. Now, what is it that is going to heal that human need which exists only in individual human consciousness? Why, nothing but divine Love. And why has not divine Love already net that human need which you and I see all about us? Simply because our individual consciousness has not been filled with divine Love. . . . If your or my consciousness beholds hundreds of different people, and we are entertaining hate in consciousness towards one person, the hate which we hold in that consciousness cannot be separated so that it will affect everything and everyone of which and of whom we are conscious. He teaches us how to govern our thoughts and so spiritualize them that we rise above the carnal or human, and reflect the divine.